Water has never been more in demand, and innovative approaches to improving water security have never been more imperative. As our global population grows exponentially, cities and towns expand to accommodate new inhabitants, providing the resources and services they need. Rapid agricultural and industrial development continues apace. Communities across the world, already struggling with stretched water supplies, must now do more with less: Drought-stricken Cape Town, in South Africa is expected to face ‘Day Zero’ in 2019, meaning taps in the city will run dry and people will have to queue for water; Brazil’s largest grain producing state, Mato Grosso, will harvest up to 15 percent less ‘second corn’ this year because of drought, while limited rainfall in California, U.S., continues to put local water supplies under severe pressure. In the face of extreme drought episodes like these, water recycling is receiving growing recognition as a must-do, not a nice-to-do. It is a common-sense solution for long-term water security – reducing the demand for additional water resources and often providing a more cost-effective solution than treating a raw water resource. In late 2017, global water technology company Xylem commissioned a survey of California residents in late 2017, to learn more about the population’s attitudes to recycled water. One of the worst droughts in a generation hit the state in recent years with devastating consequences; millions of trees died, native fish could not migrate up rivers to spawn, while farmers were forced to rely heavily on groundwater, with some tearing out orchards. Wells dried up forcing hundreds of families in rural areas to drink bottled water and bathe from buckets. A drought emergency was declared in 2014 and shortly afterwards officials ordered mandatory conservation for the first time in state history. While the drought emergency has now been declared over, recent reports indicate climate change will make California’s drought cycle even more volatile. Xylem released the survey findings recently at a time when the California State Water Board is seeking public comment on new regulations to advance using direct potable water reuse across the state. According to the statewide survey, an overwhelming majority of California residents believe another drought is looming and 90 percent are concerned about future water supplies. 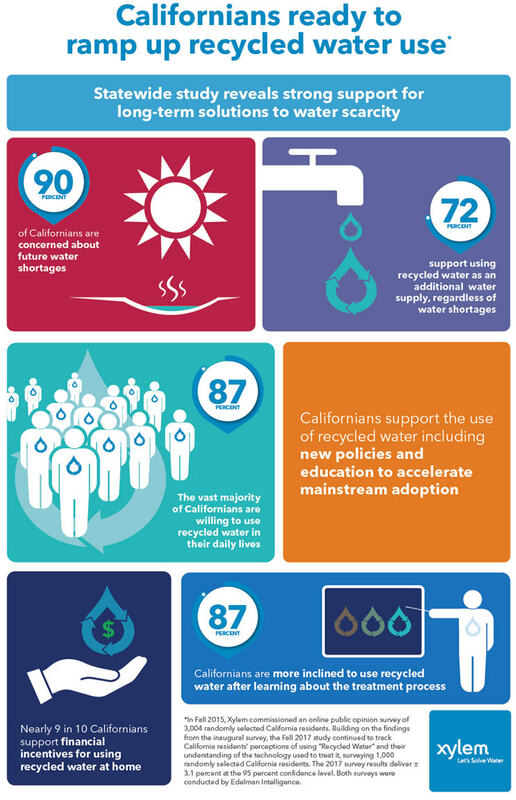 Encouragingly, nearly three-quarters of Californians (72 percent) support using recycled water as an additional local water supply, regardless of water shortages, while a clear majority (87 percent of survey respondents) are willing to use recycled water in their daily lives. The survey also revealed implications for public policy about recycled water for personal use. Californians expect to receive rebates, reduced costs or other incentives for using recycled water. Almost 90 percent of respondents said they would support using recycled water if it reduced their monthly water bill, and the same percentage supports statewide actions by water agencies to adopt recycled water as a standard practice to prepare for future droughts. Almost 90 percent of respondents continue to believe that technologies used to purify water are effective. Furthermore, California residents are more willing to use recycled water for personal household purposes after learning more about the technologies used to purify the water. For example, after reading about the treatment process, 75 percent of Californians surveyed reported that they are likely to trust the treatment process that is used to purify recycled water. This study highlights the importance of public education to build support for water reuse, a factor borne out by the experience of communities around the world. The city of Perth, for example, is set to receive up to 20 percent of its drinking water from reclaimed sources in the coming decades. This follows a ten-year journey of research and a comprehensive public education campaign incorporating a visitor center and trial facility where school children and their parents were taught about the technology. According to an Australian Water Corporation survey conducted following the public education phase, 79 percent of Perth residents were in support of the scheme. The Orange County Water District, located in Southern California, has also been lauded for its efforts to build public acceptance for water reuse, recently setting a Guinness World Records title for purifying the most drinking water in 24 hours. Since 2008 the Groundwater Replenishment System, a collaboration between Orange County Water and Sanitation Districts, has provided vast amounts of recycled drinking water to north and central Orange County. The system is the world’s largest advanced water purification project for potable reuse and has been hailed as the global model. As the United Nations (UN) warns that half the world population will face water scarcity by 2030, accelerated by climate change and population growth, we all need to embrace water reuse as a smart and sustainable means of securing water supplies. Our recent survey shows that, thankfully, California residents have not forgotten the pain of recent drought years, and it is encouraging to see continued strong and widespread support for recycled water as one solution to building water resilience in the state. We must leverage this positive sentiment and act on it. Public and private organizations must work hand-in-hand to make water recycling the norm and ensure that our collective ‘Day Zero’ never comes. In Fall 2015, Xylem commissioned an online public opinion survey of 3,004 randomly selected California residents. Building on the ﬁndings from the inaugural survey, the Fall 2017 study continued to track California residents’ perceptions of using “Recycled Water” and their understanding of the technology used to treat it, surveying 1,000 randomly selected California residents. The 2017 survey results deliver ± 3.1 percent at the 95 percent conﬁdence level. Both surveys were conducted by Edelman Intelligence.